Old-railway as bridleway/footpath for Draycott? News is filtering in that it may not be long now before the old Cheadle to Cresswell branch railway-line is declared a ‘permissive path’. The four-mile long line, which was closed in 1978 after nearly a hundred years in operation, was leased last year by Network Rail to the Moorlands & City rail company. MCR have since removed what remained of the old railway tracks. (Click here for the background to that story). See bottom of this article for map references. Right now, the trackbed is still their private property. However, with no likelihood in the near future of it being used again for rail traffic, local activists have been campaigning for it to be given over to public use as a green path. Our local county councilor, Mike Maryon, says he thinks the chances of that happening are now better than evens. Worries that there could be liability if a walker were injured by falling masonry from the two bridges on the stretch (both at Totmonslow) seem to have been overcome. It’s not only walkers who would be interested to see the track made available to them. Horse riders have also expressed interest. Members of the Churnet Valley Riders group are pressing for access to the line. They have told us that only 4% of footpaths in Staffordshire are also bridle-paths, and even then most of them are concentrated in certain areas (such as Freehay) – so there is a real need. At the moment, the track makes for uncomfortable walking as it is pretty much still lined with the old stone ballast (which would also make it unsuitable for horses) – but a simple rolling process could make it usable say CVR. (However, that would make it more attractive to quad-bikers as well, which may be a disadvantage). 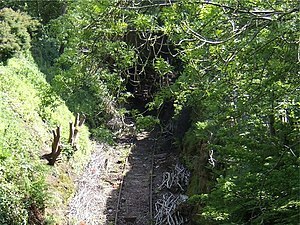 At one stage, there was an idea that the line might be restored to the working rail network. MCR has already says it plans to re-open the old line going west from Cheadle to Stoke (via Endon); and there was speculation that, having taken on the lease with this Cheadle-Totmonslow-Cresswell stretch, they might want to rebuild it too. But the chances of that however seem next to nothing. Not only is the Cheadle end now built over by a housing estate, but the fact is that a few bits of the track along the Cresswell stretch are now private gardens! When British Rail employees were living in the Railway Cottages terrace (which is just off Cresswell Old Road near the Izaak Walton Inn), BR sold them parts of the decommissioned line in the 1980s for them to use as gardens. The present residents would have to be willing to sell if the old line were to be restored. The fact is that you’d have to trespass over these gardens if you wanted to complete the whole walk (or ride) right through to the Sandon Road end of the line in Cresswell. So, the current advice is that a walker should turn off the track at Upper Newton Farm and take the present public footpath from there to meet Cresswell Old Road. So… lots still to think about, and to do, but it looks like Draycott in the Moors could soon have a new ‘permissive’ public footpath. The line of the old railway can be seen on an Ordnance Survey map. It runs from Cheadle High School to Huntley to Totmonslow to Newton to Cresswell. There was also a short branch off it that went to New Haden/Draycott Cross Colliery. This entry was posted in community action, leisure and tagged cresswell, footpaths, Moorland & City, railway, totmonslow. Bookmark the permalink. What a sad saga ! A classic R.Beeching/E.Marples error of the late 1960’s in the monumental short-sightedness in not accounting for future population increases/road congestion/lots of big trucks-road freight (but Transport Minister Earnest Marples had vested interests in road building companies), that this link, along with many that should have been kept in use or mothballed for future population rises. So short sighted, seeing the congested & rougher roads. And for a town the size of Cheadle, having no rail link is just nuts really ! And don’t believe all the cobblers’ that the line re-instatement is too expensive, most of the route & embankments just need checking, trimming & re-ballasting. But…oh no!.. might have to pay a bit out in compulsory purchase for bottom garden sections of the houses near the main line -is this really the main hindrance to re-opening ?…when you see how much effort went in to building the line – what a waste ! Bad enough that the Cresswell station building was demolished, and not rented out (photos are on ‘Staffordshire Past Track’ website). I am not a Draycott resident now, but up until we moved away for work in 1988, my mother was on the Village Parish Council & Senior Citizens group, and she often inquired about the Cheadle branch line’s re-opening status, but was fobbed off with usual excuses ! I had seen some comments by a MCR spokesperson, that the reason for the old rails being lifted was/ to replace them with new metal that would be also suitable for light diesel power units & carriages to then use this re-instated link. The Totmonslow halt would be great for eastern end of Draycott, Upper & Lower Tean, and a small station could still be built for Cheadle (council planning were quick enough in getting fees for granting the recent houses to be built – yes, quick on that, but is a complete disservice to locals in access to the rail network). The big increases in UK population, for good & wrong reasons, mean the transport planners no longer have the luxury to put off re-opening branch lines (notice Scotland seems to be quicker at re-opening) – seeing as all the increased road freight is making the roads wear out sooner ! Greatly needed is off-road horse riding in this area. looking forward to permissive use when hopefully been approved.